It's a Canopy and Extended Event Tent in 1! 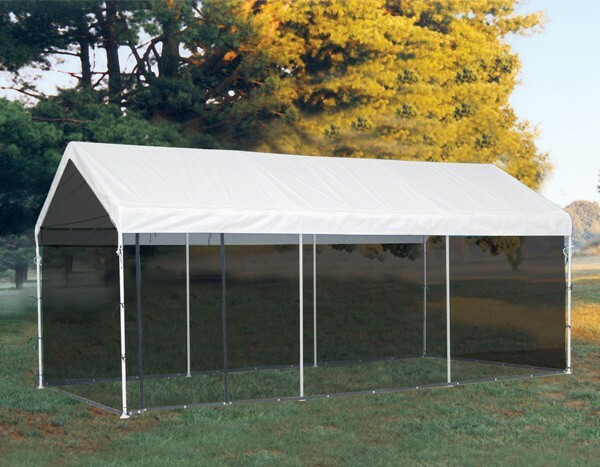 Quickly convert your 10' x 20' canopy to a fully enclosed screen house. Our strongest 1-3/8" canopy unit, the 10' x 20' MAX AP is perfect for seasonal vehicle storage, backyard events, camping, craft fairs or special events. Starting with high grade steel, every frame pipe and connector is subjected to a proprietary 13 step Rhino Shield steel surface preparation process. Heavy duty 1-3/8" all steel frame, is bonded with Dupont thermoset baked on powder-coated finish that holds on tight and prevents chipping, peeling, rust and corrosion, delivering a more lightweight and portable unit. Advanced engineered, triple-layer, enhanced weave, rip-stop, polyethylene cover is 100% waterproof. UV-treated inside and out with added fade blockers, anti-aging and anti-fungal agents. Fitted, fully valanced cover. Quick and easy set up built in with slip together swedged tubing and Patented Twist Tite tensioning squares up frames and tightens down covers for a clean and finished look. 1-3/8" diameter 17-gauge steel tubing with white powder-coated finish. Side Leg High to Valance: 6'3"
Fully enclosed Screen House Kit goes up or down in minutes. Fitted, fully valanced polyethylene cover. 50+UPF rating blocks more than 98% of UV harmful rays. UPF represents Ultraviolet Protection Factor and indicates how much of the sun's radiation is absorbed. 50+UPF is the highest fabric rating for radiation exposure. Only 2% of the UV rays will penetrate through the shade fabric. Twist Tite™ tensioning squares up frames and tightens down covers.